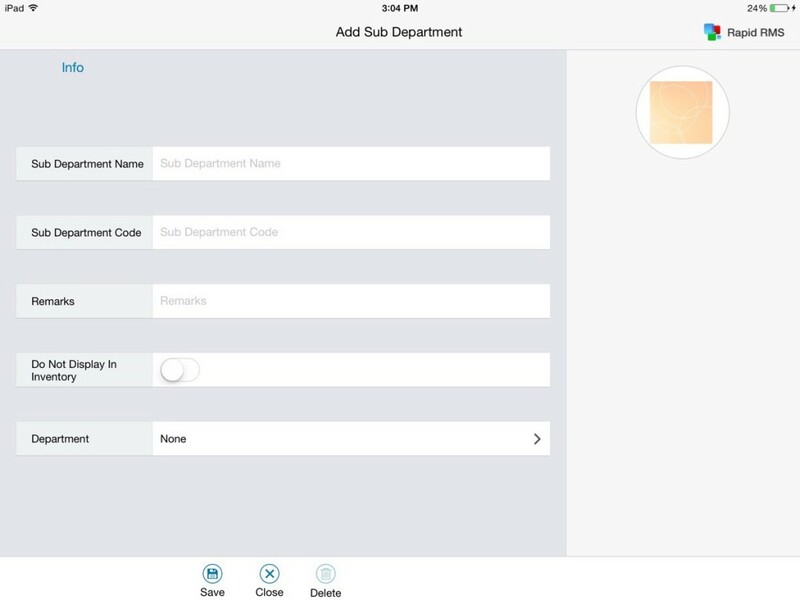 Sub department master is a module in which you can add new sub department, Edit/delete existing sub department and add department into sub department. Sub department module is available in restaurant. 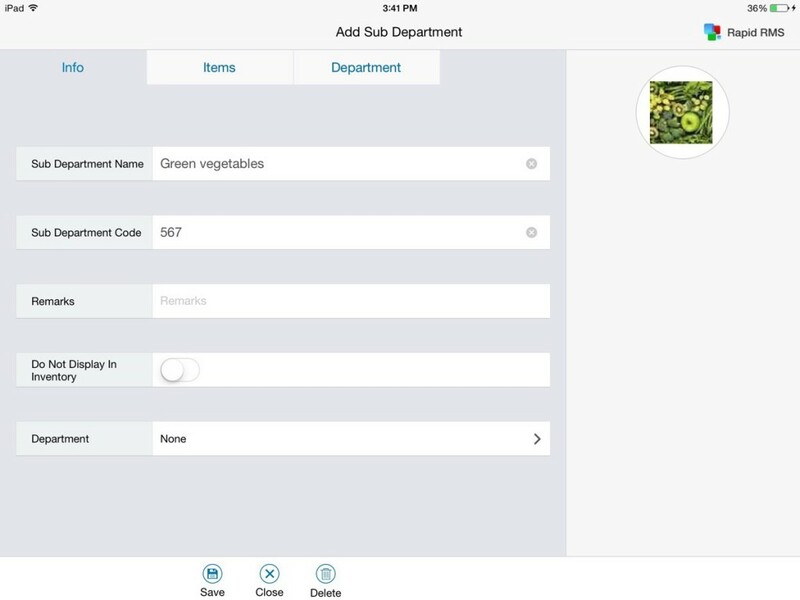 3: Select sub department master from item management menu from the top left corner. 1: Click on new sub department button for adding new sub department in sub department master. Sub department name: It is for name of sub department. Enter name of sub department. I.e. cold drinks could be name of sub department. Name of sub department must be unique. Sub department code: Sub department code is used for record keeping. It can be numerical value or alphabet letter. Sub department code is compulsory to add for adding new sub department. i.e sub department code could be 001. Department: It is field for to allot department to the sub department. 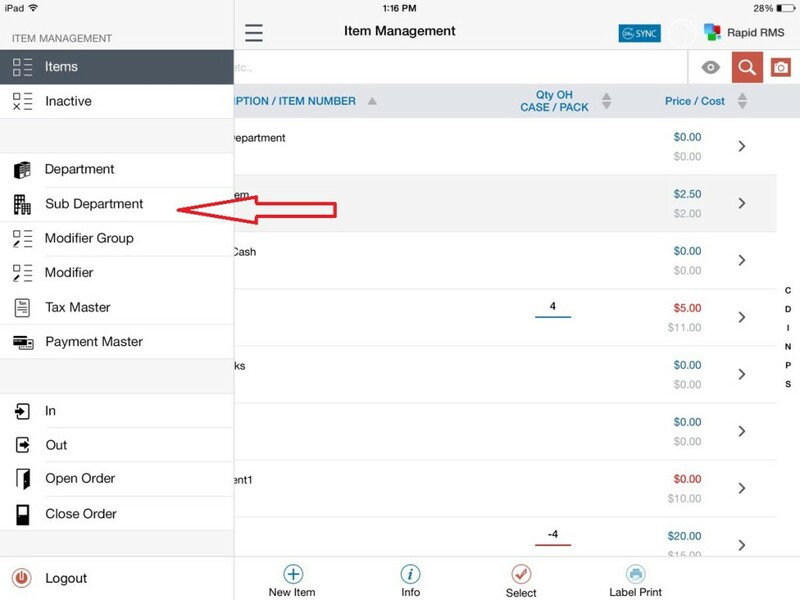 You can assign any of department from list. Current sub department is part of Selected department. 2: Add image of sub department. Select one of the following options: Take A Photo, Choose Existing, or Internet. You can use the remove image option to remove the previously added image. 3: Click on save button. You can edit already existing sub department details. 1: Click on any Sub department name for editing detail. Sub department will open in edit mode. The following screen will appear when you click on any sub department while in editing mode. 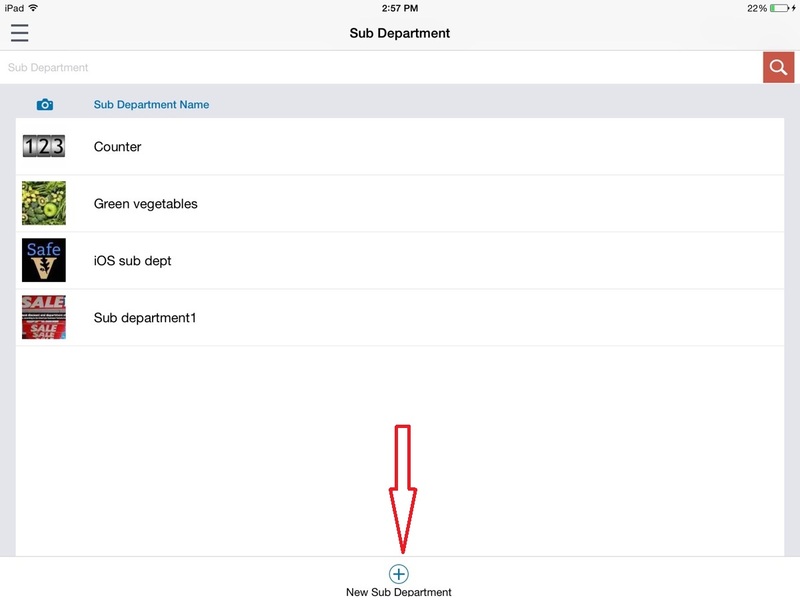 2: When you open a sub department in edit mode, a screen will appear asking for the sub department name, sub department code, Remarks, and the sub department image. If you want to change any details, then put them in and click the save button. 3: If you don’t want to edit then click on cancel button. One tab is of item. 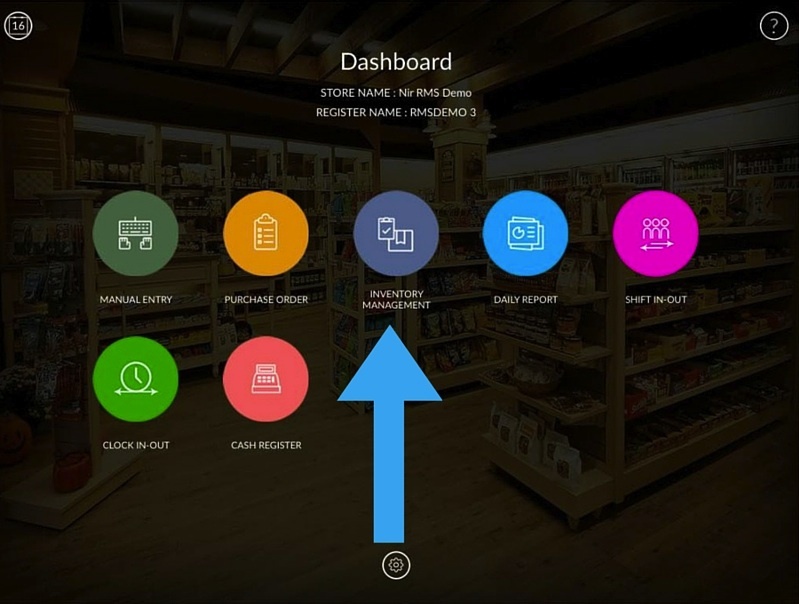 This displays all items available in sub department. And another tab is of department. This displays department list in which this sub department is linked up. 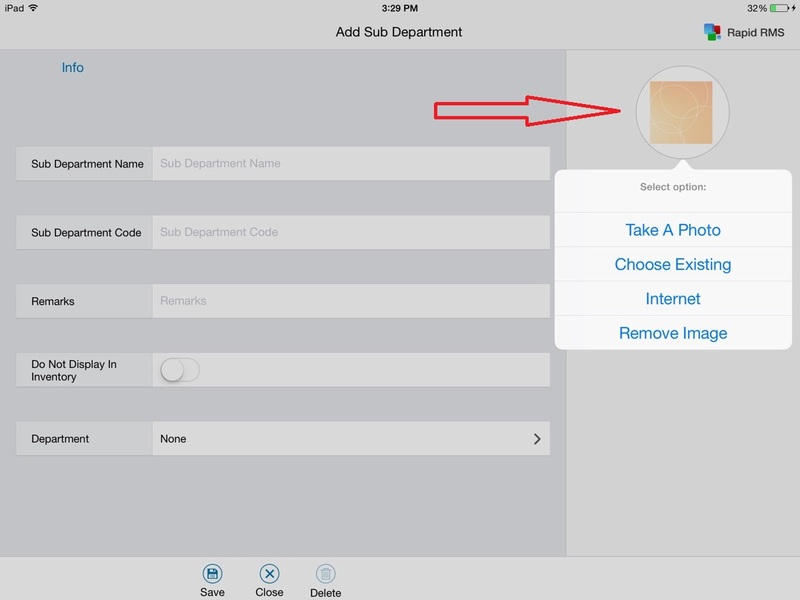 1: When you want to delete an already existing sub department, open that sub department in edit mode. Click on the delete button, and then click on yes. This will delete the sub department. 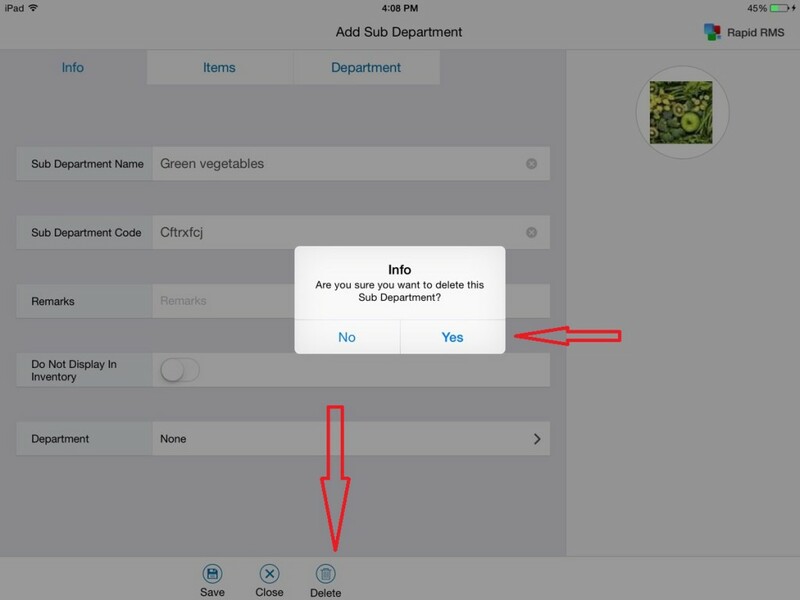 2: At the time of creation, you are not able to delete sub departments. You can only delete existing sub departments.